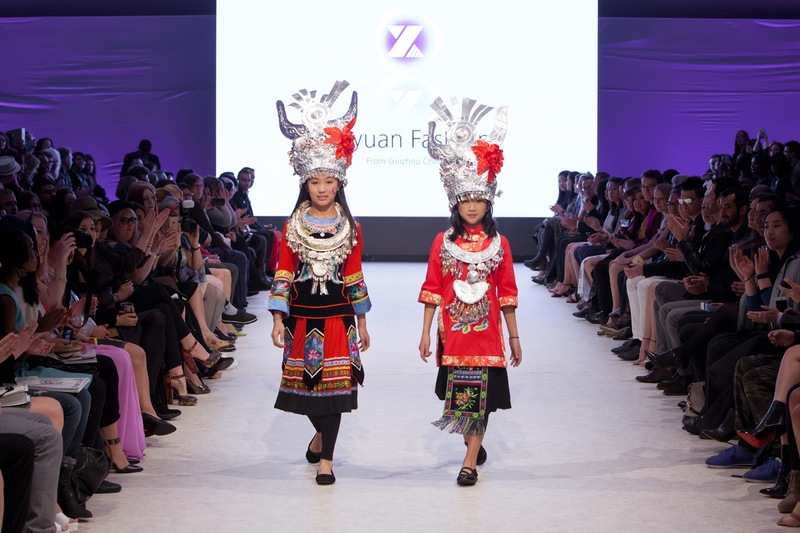 The last day of shows at Vancouver Fashion Week F/W 15 you could see two things - the excitement to see what would be offered on the runway this day and the weariness in those of us who have been in our seats for every show each and every day. We all welcomed the energy my friend and the evening's emcee Symone Says brought to the event. She had us again doing the wave and had a true gift for connecting with interesting individuals in the audience. 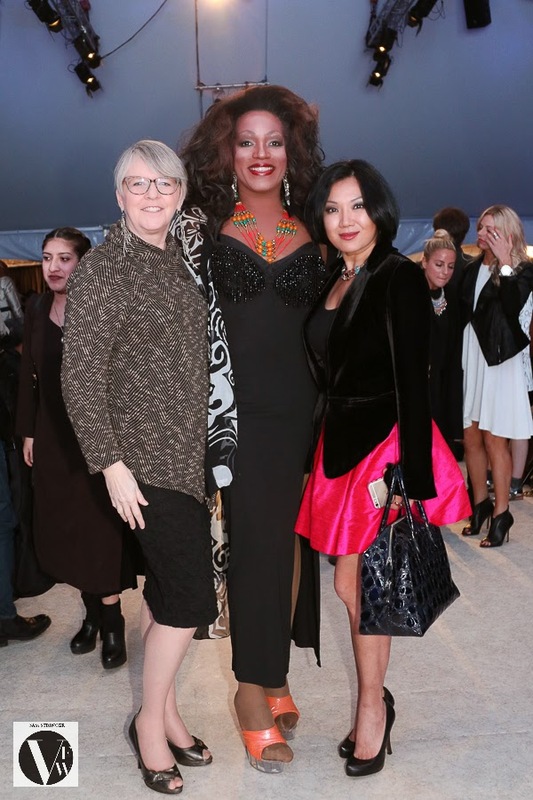 I was also really excited to see fellow Influence Publishing author Belynda Lee (Five Inch Heels) in the audience and quickly snapped a picture with both. This was my volunteer appreciation day, something I do each season. There are a multitude of people working each and every day you don't see on the runway - front door, backstage, seating attendees, dressers, hair stylists, make-up artists, technical staff, photographers, bar staff, food service and more. They don't get their picture posted or mentions in write-ups, so each season I try to thank them by bringing a treat. Mama Costco was the supplier as I did not have time to bake, but the selection this season included mini-cinnamon rolls, one-bite browns, and cake balls dusted with sugar, powdered sugar or cinnamon sugar. The cake balls were only for front of house as I didn't want to take a chance with it getting on the clothing backstage. My outfit this evening was oh so comfortable. The top was a knitted sweater jacket by designer Sofia Méndez Schenone of Sofia Clothing. I was drawn to it on the hanger in the Fashion Capsule showroom and loved it on the runway during her show. What a gift to have her allow me to wear it this evening. It was paired with a textured, black knee length skirt by JAC, a pair of bronze heels and a pair of drop earrings created from Porcupine quills. I think my favourite pic of the jacket is the one with Jessica Luxe in the strip above as you can clearly see the black zipper detail. Shows this night offered a unique mix of styles which always makes it harder to select only four. While I have chosen to cover Crystal Commerc, Ophelia Song, JY Kim and Alcoolique, I strongly encourage you to check out the other designers who showcased collections. I am waiting for some information on this designer so be sure and check back. The show opened with two beautiful young girls fully costumed - a total hit with the audience. It was a charming note and the they did a brilliant job of opening the show. The collection that followed started with a great selection of comfortable, relaxed fit dresses in black that featured intricate images on either the back or the front. 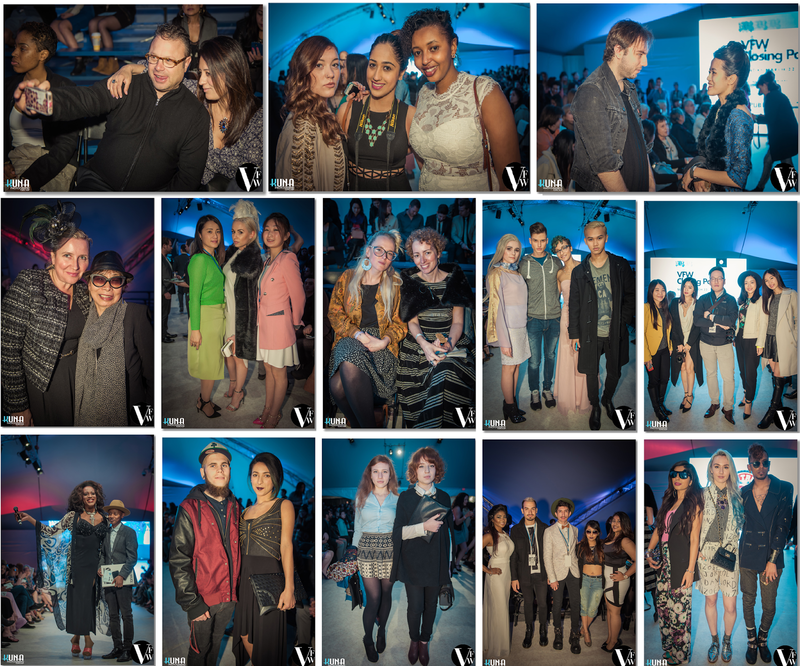 Many were paired with matching purses and the jewellery accessorizing the looks was stunning. I could definitely see several a part of my travel wardrobe in particular. There were several I was drawn to. One look that really captured my eye was in the middle below as the dress fabric was a tweedy black/white, adding an intriguing textural note to the overall look. As the show continued, we were offered several upscale, fitted dresses for evening wear with added fur detailing on some. The designer came out at the end accompanied by the same two lovely young girls that started the show - a lovely closing note. Kudos to the designer for great styling, as I when I saw something that appealed to me personally, I found myself wanting to buy the complete look including jewellery and handbag. Ophelia Song is an Chinese American fashion designer, textile designer and painter based in Los Angeles. She is the chief designer of both this line and Shakespeare's Republic. Beautiful dresses are her passion - from semi-formal to beautiful custom wedding gowns - and that's what we were treated to this evening. From her bio, "Her design aesthetic is bold and innovative; she combines western silhouettes with eastern delicate crafts." The collection was ethereal - especially the looks featuring a brilliant white with soft blue dye incorporated as an accent. I always love accent dying and this was done beautifully. Then there were feminine offerings in black and several daring sheers. While the sheers will find a limited client base that can pull them off, most of the rest of the looks would appeal to a wider clientele. I would love to know more about JY Kim, but there is just not a lot of information out there to share other than the basic resume. Born in Korea, Studied at Columbia International College, McMaster University and the London College of Fashion (where he earned a BA in Fashion Design Technology: Womenswear). This is the designer's third collection. The only personal note I could find is a quote, "I wanted to express the most confident aspect of myself and also the ideal silhouette of myself that I hoped to express through fashion." I would love to offer you more, but for now will move onto the collection. When a collection is all in a dark palette, the pictures often don't offer the reader enough detail. This is a the case here. I think the menswear was the most interesting overall. More detailing, some colour blocking with a few lighter tones included and a few really intriguing pieces that offered an edgier look without being totally wild. An example would be in the top row centre, you have a mens shirt and pant with an over skirt - the over drape would push the envelope for many west coast men, but it is understated and paired with a more traditional shirt and pant. The women's looks embraced simpler silhouettes with the exception of the jacket in the middle. The palette was two tones - a deep blue and inky black. The fit was relaxed and most garments had a gentle flow. Italian designer Rocco Adriano Galluccio is a veteran of Project Runway Italia. His love of fashion began at the young age of eight and by sixteen had begun his career as a fashion stylist. After earning a degree in Industrial Design in Naples, Galluccio moved to Milan to hone his skills. All garments in his collection are 100% made in Italy and I love his tag line - Art turning into fashion, for daring women only. Here is an excerpt from his bio, "Rocco Adriano Galluccio has the ability to combine curiosity, new ideas and cultural interest for his Neapolitan roots with a strong sense of fashion and style, and, most of all, care to details...Alcoolique is a kaleidoscopic, edgy world capable of catching the public interest and attention." On the runway we saw a mix of fun, flirty, flared, fitted, denim, prints, sheers and sequins. There really was a little bit of everything. Looks were all feminine but ranged from casual to red carpet, from laid back to daring. Definitely a few looks not for the faint of heart - not everyone can carry off a sheer body or heart appliques over their breasts. But this designer definitely brought high energy and fun to the evening and the audience responded. Missed this season? A new season will hit the runway in September. Hope to see you there.